From 2011 to 2015, 30,532 cases of Legionnaires' disease (LD) were reported to the European Centre for Disease Prevention and Control (ECDC). Several factors have contributed to the increase of Legionnaires' cases in Europe. Previous studies have suggested that changing environmental conditions, especially in rainfall and temperature, have affected the number of cases 6 7 8. Additionally, the population structure of the EU/EEA is changing, with an increasing proportion of older persons who are more at risk of infection. Nevertheless, with effective water management, Legionnaires' disease is completely preventable. ECDC has published guidelines that should be used to manage the risk of contracting Legionella, thereby protecting public health. Since the publication of the WHO’s Water Safety in Buildings in 2011, The Water Safety Plan (WSP) approach is being adopted across European countries as the most effective way to minimise risks from poor water quality from source to point of use. It is a preventive approach which aims to identify weak points in a system where waterborne hazards could enter, and which might increase within the system to levels which pose a risk to users and anyone else who may be exposed. The WSP should include a detailed description of water systems, a risk assessment and management monitoring plan. Moreover, a review of governance procedures and training requirements should also be considered. It is important to remember that European guidelines should be regarded as an example of good practice and can differ from national legislation. National legislation should always be adhered to where relevant; but where legislation exists, European guidelines can also be used to enhance investigations. Temperature is one of the most important environmental factors influencing the growth of legionellae in water systems with growth occurring between 20°C and 45°C. 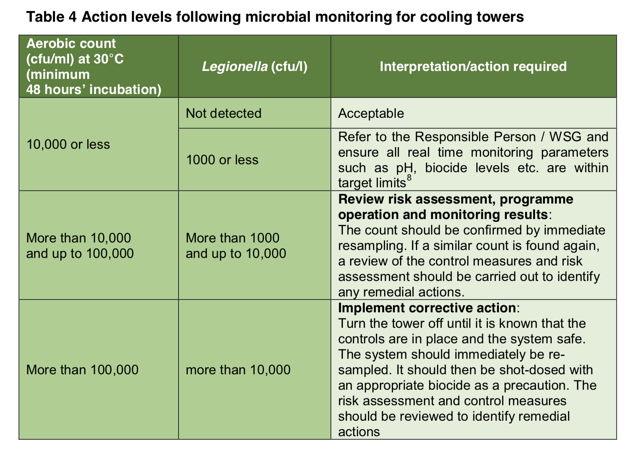 While it is acknowledged that in many countries incoming cold-water temperatures below 20°C may not be achievable, the risk assessment should consider the potential risk of infection, which increases with higher temperatures. In hot water, if temperatures fall below 45°C, Legionella will grow. Although above 40°C many other bacteria which support the growth of legionella start to die, Legionella can still grow relatively quickly inside amoebae. How does temperature affect the growth of Legionella? 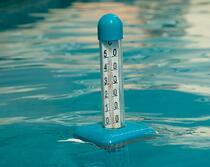 Do all water systems require a Water Safety Plan ? Not all systems will require elaborate risk assessments and control measures. For smaller low-risk systems, the risk assessment may conclude that there is no reasonably foreseeable risk, or that the risks are insignificant and are being managed properly. No further action may be required at this stage, but existing controls must be maintained and monitored. Legionella Training - Who is Responsible? those with underlying chronic diseases such as diabetes and chronic lung and heart disease. the routine monitoring of background bacterial counts (total viable count (TVC)) in evaporative cooling towers and spa pools. It is important to understand a sample taken from a water system is only a small proportion of the total system volume and that a negative Legionella result does not necessarily mean the entire system is safe and under control. Microorganisms are not uniformly distributed throughout the water system all of the time, especially in areas of poor flow and stagnation or where controls are not effectively maintained. Generally, water samples should be taken for routine sampling as the results are comparable over time and are therefore useful for trend analysis. However, in investigations, or when following up adverse results, swab samples may be a useful addition. 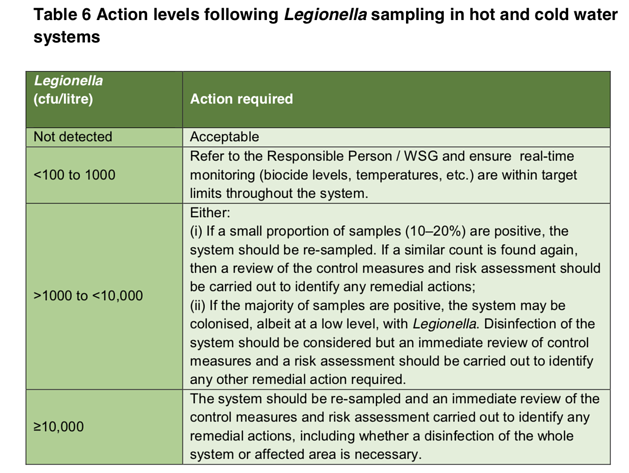 Action levels following Legionella sampling in hot and cold water systems (Table 6, page 96). The established method used worldwide for the detection and quantification of Legionella is the lab culture method known as ISO 11731. This method includes: sample collection, transport to the lab, growth (or culture) of the bacteria, analysis and production of a report. Legionella does not grow easily using culture methods and it takes 10-14 days to provide a result. 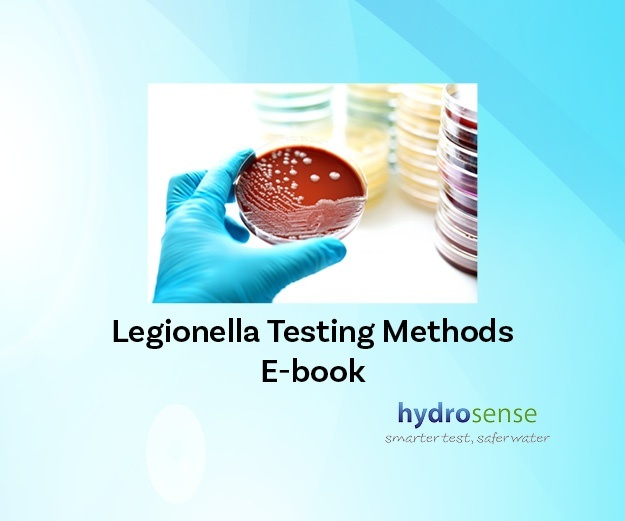 Alternative methods for quicker detection of Legionella in water samples are also available on the market and may be used to facilitate continuous monitoring of water systems and ensure the safety of the public. Regulations recommend periodic laboratory culture testing. 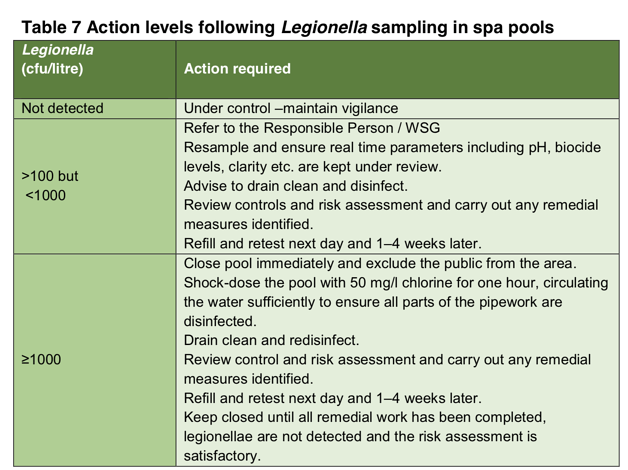 However, compliance with regulations often is not enough to protect the public from risks associated with Legionella. Alternative testing methods can provide an early warning of a potential problem and allow a fast response. If Legionella pneumophila is present in the system, it is inadvisable to wait two weeks to find out if people are being exposed to a potentially fatal infection. While carrying out laboratory culture tests might ensure compliance with the regulations, it can also be argued that not all reasonable measures have been taken to prevent an outbreak given the availability of the alternative testing methods. If the presence of Legionella in the system resulted in a fatality, it could be seen as negligence for not using an available, faster test. The Hydrosense Legionella antigen test utilizes lateral flow test technology, which is used in many medical tests for detecting Legionnaires’ disease in humans. This innovative technology has been optimised to quickly detect cell surface Legionella antigen in all kinds of environmental water samples. The test is designed to be highly specific for Legionella pneumophila serogroup 1 - the species of Legionella which is responsible for 70 to 92% of laboratory-detected Legionellosis cases in the United States and Europe2. The recovery rate of 80% in rapid-antigen testing is better than the lab culture method, which is typically 10-60%. 3 It also detects the viable but non-culturable (VBNC) and the motile phase of the Legionella pneumophila, which are the most virulent phases and cannot be detected by the lab culture method. Rapid antigen testing is done on-site so there is no need to transport the samples to the lab. The results are then provided in 25 minutes. 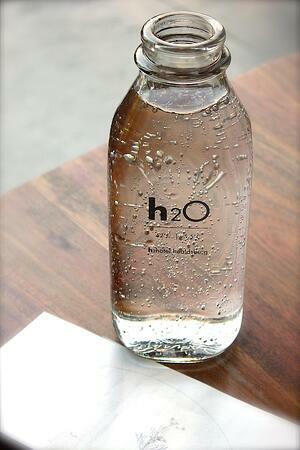 time-saving and improved water quality. Hydrosense reduces public and employee health risk by minimising the time taken to identify Legionella bacteria and capture results for ongoing verification and risk management requirements. In parallel with periodic lab testing, or as a stand-alone method, this simple test allows organisations to maintain vigilant control of water system quality. The test improves detection rates of Legionella bacteria and provides results, on-site and within minutes. 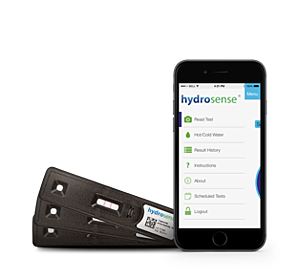 Further result verification is provided by the Hydrosense smartphone reader and portal. Find out more about Legionella testing methods available on the market. Mercante, J. And Winchell, M. (2015). Current and Emerging Legionella Diagnostics for Laboratory and Outbreak Investigations. [online]. Available at: https:// www.ncbi.nlm.nih.gov/pmc/articles/PMC4284297/ [Accessed 6 May 2018]. IWC 2008 - Neil Polwart, Ross Grant, Howard Barnes, Eric Holmes, Tom Lindley and Andrew Cooper- A Field Test for Rapid Detection of Legionella pneumophila serogroup 1 in Water Samples. Beauté, J. o. (2017) LEGIONNAIRES’ DISEASE IN EUROPE, 2011 TO 2015. Eurosurveillance. [online] Available at: : http://www.eurosurveillance.org/ViewArticle.aspx?ArticleId=22829 [Accessed 28 Aug 2018]. European Centre for Disease Prevention and Control (2017) ECDC SURVEILLANCE REPORT Legionnaires’ disease in Europe. [online] Available at: https://ecdc.europa.eu/sites/portal/files/documents/Legionnares-disease-europe-2015.pdf [Accessed 28 Aug 2018]. Sakamoto R. (2015) Legionnaire’s disease, weather and climate. Bull World Health Organ. 93(6):435-6. [online] Available at: https://doi.org/10.2471/BLT.14.142299 [Accessed: 28 Aug 2018]. European Environment Agency (2012). Climate change, impacts and vulnerability in Europe 2012 an indicator-based report. Luxembourg: EEA; [online] Available at: http://www.eea.europa.eu/publications/climate-impacts-and-vulnerability-2012/at_download/file [Accessed: 28 Aug 2018].